This book throws new light on the study of India's development through an exploration of the triangular relationship between federalism, nationalism and the development process. It focuses on one of the seemingly paradoxical cases of impressive development and sharp federal conflicts that have been witnessed in the state of Punjab. 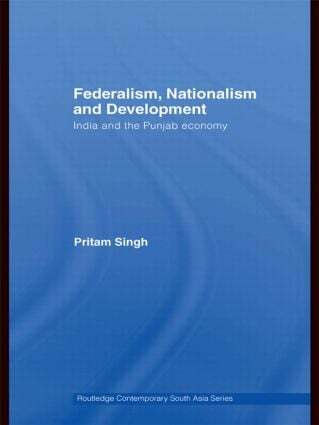 The book concentrates on the federal structure of the Indian polity and it examines the evolution of the relationship between the centre and the state of Punjab, taking into account the emergence of Punjabi Sikh nationalism and its conflict with Indian nationalism. Providing a template to analyse regional imbalances and tensions in national economies with federal structures and competing nationalisms, this book will not only be of interest to researchers on South Asian Studies, but also to those working in the fields of politics, political economy, geography and development.